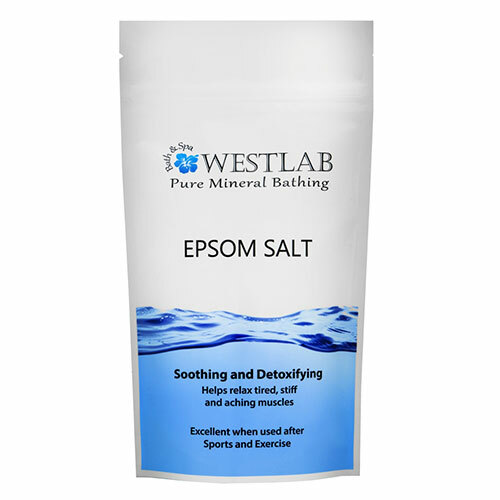 Soothing and Detoxifying, Westlab Epsom Salt helps relax tired and aching muscles when cleansing oneself with water. Excellent when used after Sports and Exercise. Established in 2004, Westlab are the UK`s leading mineral bath salt experts, trusted to source only high quality, pharmaceutical standard Epsom Salt. Epsom Salt is a natural solution aid for a fit and healthy body. This tried and tested mineral, which has been around for hundreds of years, is ideal for muscle relaxation, sports recovery, and helping to reduce fluid retention. It has long been a bathroom staple used by renowned athletes and trainers, and is fast becoming a celebrity secret to help maintain a slim, healthy looking figure. 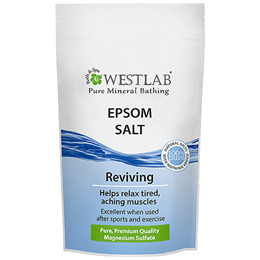 Westlab Epsom Salts are made of pure Magnesium Sulfate. The salts are great for helping with removing of toxins from the body, encouraging muscles to relax and assisting in recovery as well as increasing magnesium levels. Magnesium aids muscle control, energy production and helps regulate the activity of more than 300 enzymes in the body. Westlab are committed to only using the highest quality, genuine salts. They travel the globe to work directly with salt miners and producers. This not only ensures premium salt is delivered at great prices, but also guarantees standards of consistent high quality. Bathing instructions: Dissolve salts in a bath of 37-39°C. Relax and soak for 20 minutes to relax tired and aching muscles use 500g-1Kg. For general skin health and wellbeing add 100g-250g to your normal bath. Below are reviews of Westlab Epsom Salt - Reviving - 5kg by bodykind customers. If you have tried this product we'd love to hear what you think so please leave a review. Love this product! Good price and would recommend. Good product at a good price, speedy delivery too. These are fantastic and have become a staple in our families bath time routine. I recently woke feeling very flu like and aching all over. I had a long soak in an Epsom salt bath (and for the next few days) and it really helped. Excellent value for money. Fast delivery and good service. Good service and very good product for a very reasonable price. I will be ordering again later on. Have read up recently on how beneficial Epsom salt baths are. I mix my salts with coconut oil for a truly moisturising soak. This is a HUGE bag but very cost effective. Will last me months! Great product, price and speedy delivery. Great for a relaxing, aches & pains relieving soak after a hard day of decorating, walking or any physical exercise.Just add a little bicarbonate of soda and a few drops of lavender and soak your stresses/aches away. Also helps with my fibromyalgia and back problems.Good value. Brilliant product, I use to detoxify and relax muscles, excellent price, quick delivery really pleased with bodykind, I have recommended to my family & friends thank you bodykind. I have bought these salts before for my son who still plays in Sunday league football but being in his mid forties suffers for it ! He finds them very helpful for his aching muscles so I have bought him a good supply. They are very good value and free postage too. Excellent buy, thank you. The salts are really good. My husband is a builder and comes home aching and stiff, these salts really work in easing his muscles. I combine them with essential oils and it's very revitalising. Soothing and Detoxifying, Westlab Epsom Salt helps relax tired and aching muscles. Excellent when used after Sports and Exercise. Westlab only source the highest quality Epsom Salt. Pure, Medical Grade Standard.